Prepare the pudding according to package instructions. Refrigerate and let rest until creamy. 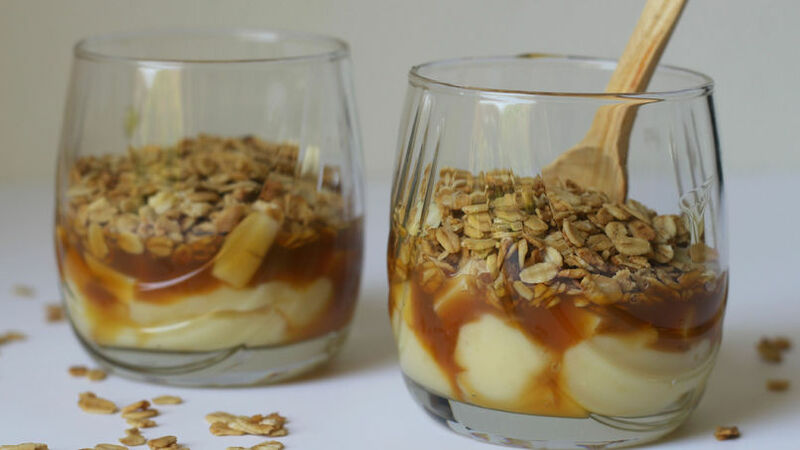 In clear glasses, put a layer of pudding, cover with some caramel, a layer of diced apples and some granola. Repeat, and finish with a layer of granola. You can refrigerate for a short time or serve to enjoy immediately. To cut down preparation time, you can also use cups of pre-made pudding. These pudding, apple and caramel cups have become one our favorite desserts. When you’re craving something sweet, and above all, when you don’t feel like preparing a big dish with multiple ingredients, this recipe is a win-win. Preparation time is cut down considerably if you use premade pudding cups that can be purchased in the supermarket. Stir in caramel sauce, add a touch of freshness with sweet apples and finish with A touch of something crunchy by sprinkling granola over it. This recipe couldn’t be easier!